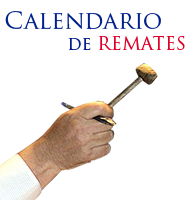 REMATE * 08-DIC-18 * 09:30 Hrs. 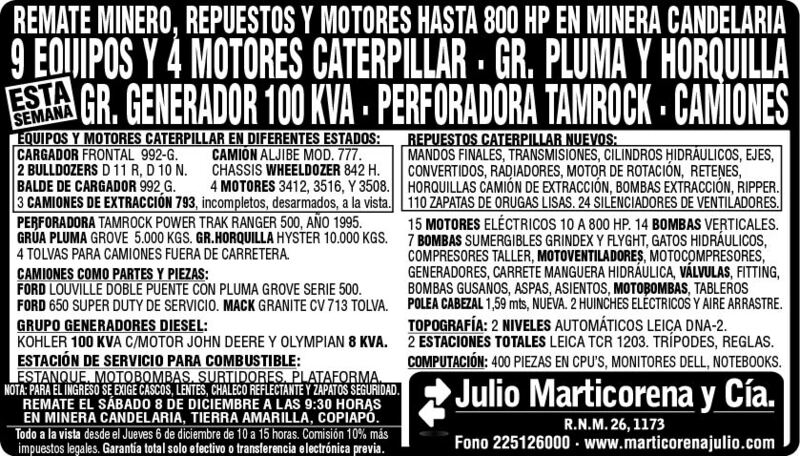 EQUIPOS CATERPILLAR FUNCIONANDO A LA VISTA: 2 BULLDOZER D10N, WHEELDOZER, MOTONIVELADORA 16H. CARGADOR FRONTAL 992-G - CAMIÓN ALJIBE MOD. 777. PERFORADORA TAMROCK POWER TRANK RANGER 500, AÑO 1995. GRÚA PLUMA GROVE 5.000KGS.- GR. HORQUILLA HYSTER 10.000KGS. 4 TOLVAS PARA CAMIÓN FUERA DE CARRETERA. FORD LOUVILLE DOBLE PUENTE CON PLUMA GROVE SERIE 500. FORD 650 SUPER DUTY DE SERVICIO - MACK GRANITE CV 713 TOLVA. KOHLER 100 KVA C/MOTOR JOHN DEERE Y OLYMPIAN 8 KVA. ESTANQUE - MOTOBOMBAS - SURTIDORES - PLATAFORMA. HORQUILLAS CAMIÓN DE EXTRACCIÓN - BOMBAS EXTRACCIÓN - RIPPER. 110 ZAPATAS DE ORUGAS LISAS - 24 SILENCIADORES DE VENTILADORES. POLEA CABEZAL 1,59MTS, NUEVA - 2 HUINCHES ELÉCTRICOS Y AIRE ARRASTRE. TOPOGRAFÍA: 2 NIVELES AUTOMÁTICOS LEICA DNA-2. 2 ESTACIONES TOTALES LEICA TCR 1203 - TRIPODES - REGLAS. COMPUTACIÓN: 400 PIZAS EN CPU´S - MONITORES DELL - NOTEBOOKS. NOTA: PARA EL INGRESO SE EXIGE CASCO - LENTES - CHALECO REFLECTANTE Y ZAPATOS SEGURIDAD. EN MINERA CANDELARIA, TIERRA AMARILLA, COPIAPÓ. TODO A LA VISTA DESDE EL JUEVES 6 DE DICIEMBRE DE 10:00 A 15:00 HORAS. O TRANSFERENCIA ELECTRÓNICA ESTRICTAMENTE PREVIA AL REMATE, NO SE ACEPTAN CHEQUES, NI TRANSFERENCIAS DURANTE. (NO HAY SEÑAL INTERNET). NOTA: MINERA CANDELARIA Y LA CASA DE REMATE SE RESERVAN EL DERECHO A LA SUSPENSIÓN, MODIFICACIÓN Y RETIRO DE LOTES, ASI COMO LA POSTERGACIÓN DEL MISMO. Página 1 de 7, 26 resultados por página. - REMATE MINERO CANDELARIA REMATE * 08-DIC-18 * 09:30 Hrs.